If you have already purchased one of the new Milwaukee 18V Brushless Drills, or you are just looking for an upgrade, you won't have to wait very long until you can get your hand on the new Milwaukee M18 Fuel Brushless 1/4" Impact Driver. The Impacts are expected to hit store shelves in June, and specifications look very promising. The number we are most interested in when purchasing an impact driver is the amount of torque the tool can provide. We might not always need the max rating, but it is nice to it is there. 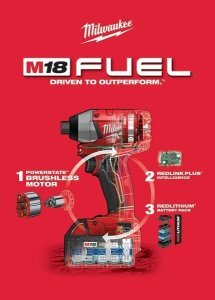 The M18 Fuel Impact is rated at 1600-inch pounds of torque while still remaining compact at 5-1/2-inches and weighing in at 3.6-pounds. 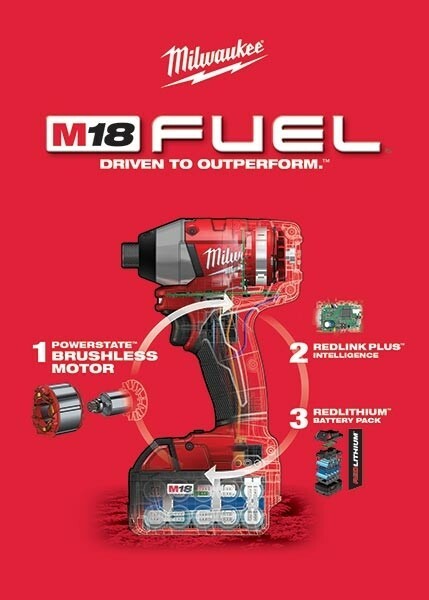 The M18 Fuel Impact also takes some cues from the competition and features a 3-speed selector that can help you match the power output to your needs. Like the M18 Fuel Drills, the Impacts also feature the Milwaukee Redlink Plus system which allows the cold weather rated Redlithium battery to communicate with the tool and the charger to provide maximum output. There is no official word on pricing yet but the kits should be around $300 or less. Milwaukee will be offering the M18 Impacts High Capacity battery kits (2653-22), Compact battery kits (2653-22CT), and a tool only option (2653-20). The kits will be the first to include a new 18V/12V combination charger.